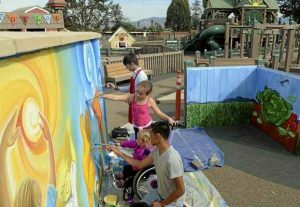 Tatum Bakker, 3, and her sister Olivia, 8, help Luis Aguilar, 17, bottom, and David Rubio, 16, as they work on a mural by Salinas artist Jose Ortiz at Tatum’s Garden in Salinas in 2013. A new park for special needs children has been proposed for Toro Park. (David Royal – Monterey Herald) See Article.